One of the unintended (but pretty interesting) side effects of the entire gluten-free movement is it’s introduced millions of people to foods they would have never known about before. Seriously, how many of you knew what quinoa was 10 years ago? My guess is a small percentage of you. For that matter, did you know how to pronounce it 10 years ago? It’s pronounced KEEN – WAH, if you’re wondering. Quinoa’s basically become a superstar of the gluten-free movement because it’s a healthy, filling replacement for the grains people love so much. Here’s the good news: not only does quinoa allow you to enjoy variations of the foods you love, but it also does so while packing a killer knockout punch when it comes to total health benefits. Rather than giving you a list of things quinoa is good for, I wanted to take the time to focus on the fantastic attributes of this gluten-free alternative. One of the first things I want to address is the most popular misconception about quinoa. Far too many people mistakenly believe quinoa is a grain; that’s not true – it’s a seed. Of course, the fact people believe this isn’t through any fault of their own; it’s been classified as a grain by all kinds of official organizations. So, just understand, if you ever hear it referred to as a grain, or a cereal grain, it categorically is not. Now that we’re past that, I’d like to take the time to tell you about quinoa’s amazing protein profile. As you know from high school biology, proteins are essential building blocks for life. Amino acids are necessary for the formation of proteins, and proteins are needed to help create things like antibodies, enzymes, structural components (like muscle fibers and the structure of cells), etc. When it comes to plant foods, most plant proteins won’t give you all of the amino acids you need. These amino acids are called essential amino acids, and they’re only able to be gleaned from your diet. Quinoa’s a rockstar because it gives you all of the essential amino acids you need. Even better is quinoa’s especially rich in some of the amino acids you generally only find in animal protein (these amino acids are lysine and isoleucine). It’s really quite high in lysine, which is complimentary to boosting immune health, helping heal muscles and working to negate poor brain function. The fact that it contains both lysine and isoleucine means quinoa belongs to a special class of food known as “complete” proteins – much better than the deservedly negative name of the “incomplete” proteins (which obviously refers to foods not containing the full spectrum of amino acids). Not to mention, quinoa is absolutely loaded with protein. A cup of quinoa is approximately 24g of protein. Whenever you compare that to most grains, it blows them out of the water in total protein content. This means quinoa is even effective at helping you lose weight, as it promotes satiety (or fullness) and can help curb appetite. The next reason to start eating quinoa is because of the fat it contains. Part of the reason I’m drawn toward quinoa isn’t just because it looks cute after it’s soaked in water for a while; it actually has more to do with the fatty acids inside. Quinoa’s rich in an omega-3 fatty acid known as alpha-linolenic acid (ALA). ALA has known anti-inflammatory properties and has a positive effect on heart health. Speaking of heart health, the plethora of fat quinoa contains is called oleic acid. Almost a third of quinoa is made up of oleic acid, which is the same monounsaturated fatty acid we find in olive oil, and it’s the same fat extensive research has found to result in reduced blood pressure and cardiovascular disease risk. Of great importance is just how much fat is in quinoa – there’s about 3.5 grams of fat per cup, which is roughly 3-5 times the amount of fat you’d find in most grains. This makes it an incredible source of heart-healthy, anti-inflammatory, energy-giving fat when compared to gluten. Not only does this little seed have the ability to positively affect health with protein and fat, but quinoa’s also loaded with free-radical fighting antioxidants. Quinoa is rich in phytonutrients, including antioxidants like ferulic, coumaric, hydroxybenzoic, and vanillic acid. Quinoa also contains the antioxidants quercetin and kaempferol in concentrations that rival those found in berries like cranberries. Quercetin is an antioxidant that many believe prevents histamine release—making quercetin-rich foods “natural antihistamines.” Kaempferol, meanwhile, may help fight cancer and lower your risk of chronic diseases including heart disease. Antioxidant flavonoids in quinoa have also been found to lower the risk of dying from heart disease. Further, the phenolic acids in quinoa offer powerful anti-inflammatory benefits, and research shows daily consumption of quinoa may lower levels of inflammation in the fat tissue and intestines of rats.10 Compare this to most grains, which tend to increase levels of inflammation in your body. Quinoa’s loaded with this heart-healthy nutrient. If you want to help protect your heart and also keep your bowels regular, there’s not many foods better than quinoa. This is because quinoa’s chock-full of fiber, the all-important nutrient essential in regularity. When it comes to total fiber consumption, the RDA (Recommended Dietary Allowance) is around 32 grams for those who follow a 2,000 calorie diet. 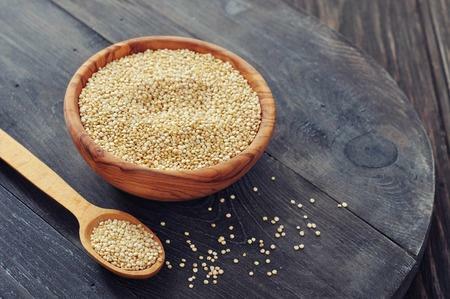 3/4 of a cup of quinoa is going to deliver a whopping 21% (5g) of fiber per serving. That’ll help promote better gut health, but it’ll also work to protect your heart. There are more than a few studies out there linking fiber intake to a reduced risk of heart disease. This gives even more credence to the heart protective properties associated with quinoa. Just like protein, fiber can cause you to feel a general sense of fullness. This of course has the obvious benefit of keeping you away from inadvertent snacking, which helps you lose weight. It’s Easy to See Why Quinoa’s a Great Gluten-Free Replacement. There’s no way around it; if you’re trying to go gluten-free, quinoa’s a great substitute. Of course, if you’re going to start eating quinoa, I highly suggest you get the organic/fairly traded kind. There are suspect types of quinoa on the market that have been exposed to pollutants and dangerous pesticides. Also, some quinoa comes from farms where the workers are treated poorly and made to work in substandard conditions. It’ll only cost you a dollar or two more, and, by making the decision to get organic/fair trade quinoa, you’re not just helping to improve your health – you’re helping improve the health of the environment and your fellow man.